New fitness and nutrition studio opens downtown just in time for your resolutions. These ladies can help you make your New Years resolutions happen. Personal trainers, Michelle Levitch (left) and Katy Nelson have opened a new fitness and nutrition studio on the second floor of the Symons Building at south 7 Howard at Sprague. It's right above the former Northwest Map store and the Lorinda Knight Gallery. The new studio has a very inviting atmosphere with skylights, a wall of windows, and vaulted ceilings. They offer a variety of cardio equipment, free weights, cable machines, core strengthening equipment, nutrition counseling, and most of all support and encouragement in meeting your New Year goals. Michelle Levitch, A.C.E. (American Council on Exercise) certified since 1995 both in Group Fitness and Personal Training, spent 14 years at the Spokane Club personal training as well as teaching fitness classes, which included Senior Fitness, Body Sculpt, Step class, and Kickboxing. Levitch is the personal trainer for Everest mountain climber Kay LeClaire, who is the first woman over 60 to climb the Seven Summits, including Mt. Everest. She was also an instructor at Spokane Community College for 5 years teaching a physical education class. Levitch offers one-on-one personal training in one hour and half hour sessions. No minimum amounts required and no membership required. She will also be teaching a Body Sculpt class, starting tomorrow, January 4th, which will be every Tuesday and Thursday from 12:05 to 12:50. The class will include: light weights, fit balls, exercise tubing, core strengthening, intervals, and stretching. The cost is $45 for the month, two days a week, $25 if you're only able to make it one day a week and $8 for drop ins. Results? Impressive! After training with Michelle two to three days a week since March, I have lost 28 pounds, 5 inches from my waist and I can do 100 pushups! Thanks Michelle! Katie Nelson, RD, CSCS, is a graduate of the University of Idaho with B.S. in Family and Consumer Sciences, Dietetics Option. She now specializes in Paleolithic Nutrition for Optimal Health and Performance, Sports and Nutrient Timing Nutrition, Nutrition for weight loss, Gluten and Dairy Free Eating, Nutrition programs for Detoxification, Sustainable and Organic Eating, and Nutrition to Treat and Prevent Health Conditions, such as Diabetes, Obesity and Cardiovascular Disease. She is also a Certified Personal Trainer and Certified Strength & Conditioning Specialist, (National Strength & Conditioning Association) specializing in sport specific training for injury prevention and improved performance, weight loss, general fitness and high intensity, short, but efficient training sessions. For more information call 509-270-0230. Get off that couch and make the call! Richard Munson died on Saturday at the age of 68, from complications with leukemia. A retired Air Force officer, he worked as a stockbroker and served on the Spokane Valley City Council as a charter member starting in 2002. He served as Deputy Mayor and was chosen as Mayor by his fellow council members in 2008. Munson was also a past president of Spokane Rotary Club 21. Services are pending. Samantha Tolley is Nosey Parker. After a long search, Nosey Parker has been found! Samantha Tolley, a resident of Liberty Lake, has accepted the position of Principal Fashionista for the Inland Northwest market of Nosey Parker. "I have followed Nosey Parker Inland Northwest for a long time and I was asked to be a model at the Best of Party for Spokane Coeur d'Alene Living Magazine. I enjoyed it so much, the next step for me was to be Nosey Parker everyday!" Tolley is an Alaskan native and has a background in acting, voice over work, sales and production for multimedia companies, radio commercial production and teaching social skills to at-risk youth at Boys and Girls Town. Nosey Parker is a sleuth and is always on the hunt for the best local shopping and services in the Inland Northwest. The Nosey Parker Experience includes a blog, social media, a guidebook and in January 2011, the Inland Northwest's first shopping and service smart phone application on the iPhone, Droid, Blackberry and as a web application. The Nosey Parker Experience launched the first guidebook in September 2008 featuring local boutiques and services. Women bought the guidebook and signed up on the website to receive newsletters and participate in social media to stay "in the know". Weekly blog post also keep women informed of new stores, product launches, sales and parties. Nosey Parker is also used as an endorsement tool for businesses that are looking to market to a niche demographic of women. Samantha Tolley, as Nosey Parker, will also help launch a new column for Spokane Savvy Magazine "Ask Nosey Parker", questions from fans and advice from Nosey Parker regarding fashion and services. Margaret Croom is the majority owner of Nosey Parker LLC. She has over 23 years of experience in the information technology industry and created the term "perketing" for permission marketing, the core of the Nosey Parker Experience. You can follow her advice and research at perketing.com. As the creator and manager of the Nosey Parker Experience, Croom created the first Buy Local program in the Inland Northwest, raised over $8000 for local nonprofits and donated just under 9000 guidebooks to area gala's and fundraisers. NectarWineBlog.com has grown from an online idea to a brick and mortar business. Nectar Tasting Room opens this Friday, January 7 and showcases five wineries from across Washington State. Occupying the first floor of the 1889 Building on the corner of Main and Stevens, Nectar Tasting Room is the satellite location for Anelare Winery, Hard Row to Hoe Vineyards, Northwest Cellars, Skylite Cellars, and Terra Blanca Winery. Visitors can experience a weekly tasting bar flight, and wines are available in 2 or 5 ounce pours and by the bottle. Nectar Tasting Room is the first local business to incorporate the use of Apple iPads as their wine menu. "Our goal is to provide visitors with a unique tasting experience where they can learn about wine and about each of the five wineries at the space," says owner Josh Wade. The iPad menu can remember the wines you tasted so on return visits you can easily recall what you liked and didn't like. Nectar Tasting Room is open Thursday, Noon – 7pm and Friday – Saturday, Noon – 9pm. A fun "after hours" party, Saturday from 9 – 10pm, called "The Final Sip", gives guests the opportunity to taste through any of the wines that are open. 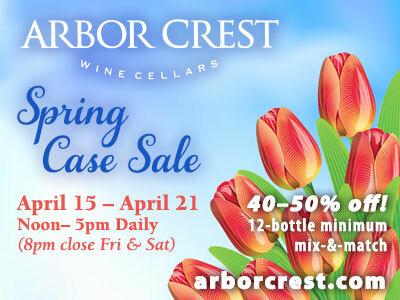 "For $10 you can come by and enjoy 5-8 wines that are already open. We don't want to dump it down the drain. It's a great way to share the wine," says Josh. 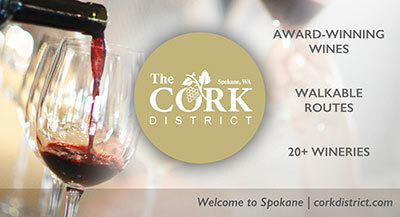 With the opening of Nectar Tasting Room at 120 N. Stevens, 25 wineries now have a presence in Spokane. Visit www.nectartastingroom.com for updates and information. Enjoy a cup of coffee while you get your dog groomed. A new specialty shop, Barks & Beans, provides a bathing and grooming facility for the dogs and a coffee house for the community. At 1314 S. Grand Blvd., a 1200 square foot space was split down the middle to accommodate a full service cafe complete with free wi-fi on one side and four dog washing stations and a grooming center on the other. The two areas are separated by large picture windows, so dogs and owners can see each other. Customers can look out the shops front windows and see the Cathedral of St. John, a block a way. Customers can relax over a latte or glass of wine or beer (available later this month) while an attendant does the bathing, or can choose to do it themselves. It is $12 for the self-washing and $20 for the attendant washing. Shampoos, conditioners, Turkish towels and dryers are all included. There are beverages, deli sandwiches, soups, salads and pastries for the people, and grooming services, treats and supplies for dogs. The shop has employed two baristas and two dog groomers. They expect they will open additional locations in Spokane and Spokane Valley. Regular hours are 7am - 7 p.m., Monday through Friday. 8am - 6pm on Saturday; and 10am – 4pm on Sundays. The shop phone is: 509-315-4057 and the website is www.BarksandBeans.com. The Inland Northwest's largest credit union starts 2011 with a change at the top. But while the title of president and CEO is new for Tom Johnson, he is a familiar leader at STCU and in Spokane. A former vice president of Whitworth University, Johnson was on the STCU board of directors from 1994 through 2006. He became STCU's vice president – administration in 2006, and was promoted to executive vice president early this year, in anticipation of January's promotion.